This winter had some extreme low and high temperatures. Much of the country had drier conditions than average, especially in the southeast and the west. Winter 2017 stands out as having the warmest average daytime temperatures by a large margin. The likelihood of winter warmth like this year is rising. Best estimate chances are shown with the vertical black lines showing the 90% confidence interval. It might feel nippy, but look out for winter heatwaves. The Bureau of Meteorology has issued its seasonal forecast for the winter, and it should be a warm one throughout southern Australia and the very tips of the Top End. After a warm autumn, particularly in the east, this winter is forecast to be warmer and drier than usual – especially over the southern half of the continent. 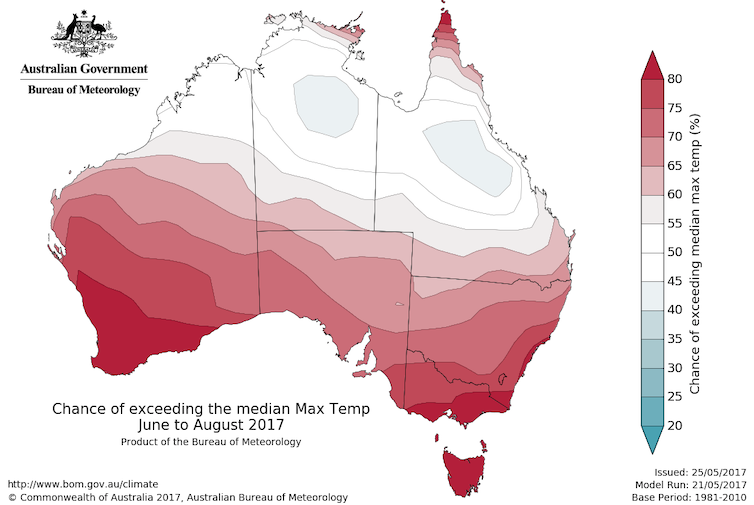 Warmer-than-average conditions are likely for most of Australia. Seasonal forecasts are very different from your standard weather forecast for the day or week ahead. Instead of giving exact temperatures or rainfall totals, the bureau provides probabilities of above or below average conditions. 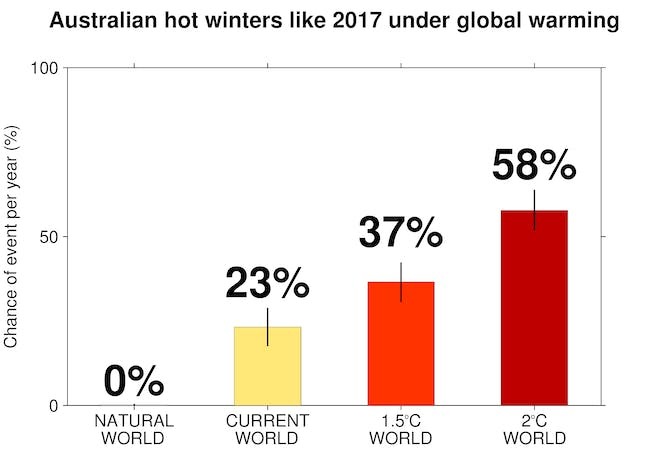 So if the bureau says there’s a 70% chance of above-average temperatures, that’s the same as saying there’s a 30% chance it will be below average. These probabilities are estimated by looking at what’s going on in the Pacific and Indian Oceans, as they strongly influence Australia’s weather, and by running a set, or “ensemble”, of forecasts through the bureau’s seasonal forecast model. Looking back to last year, while most of Australia experienced quite a warm winter, it was also very wet. 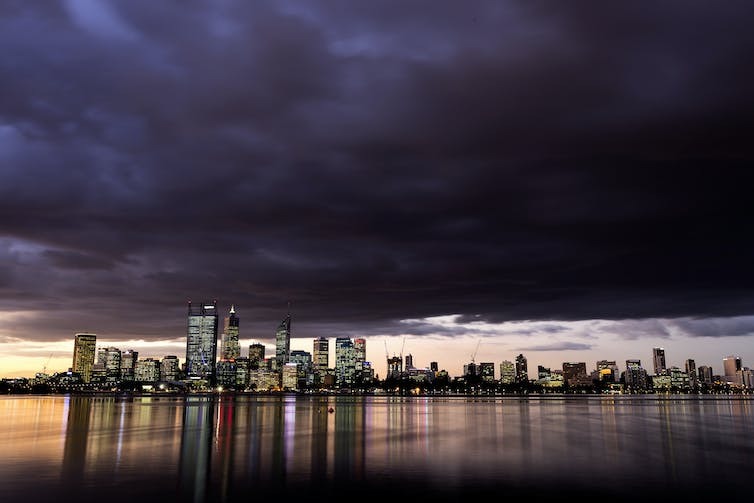 Nationally, it was the second-wettest winter on record, with the centre and the east of the continent copping the brunt of the rain. Last winter’s weather was driven by very warm seas in the east Indian Ocean, which meant a lot more moisture was available to deliver rainfall across the country. Last winter was very wet for the east, although dry around Perth. This year we are seeing roughly average temperatures in the Indian Ocean, and a slight El Niño in the Pacific. This increases the likelihood of warmer, drier weather for the winter as a whole. So can we expect to keep the thick coats in the wardrobe and enjoy some winter warmth? Perhaps. Of course, winter heatwaves aren’t going to bring 40℃ days to Melbourne and Sydney, but we could get warm spells and temperatures into the low twenties in Sydney or the high teens in Melbourne. It’s also worth noting that the seasonal forecast only looks at whether we’re going to have temperatures above or below average. It’s harder to predict whether we will see bursts of heat, or if the weather will consistently be a little bit warmer than normal through much of the season. We’ve seen an increase in heatwaves in late autumn and winter in Australia over the past few decades. Notably, in May 2014 Sydney and large areas of southeast Australia had much-warmer-than-average conditions. A study found that this heat event was made at least 20 times more likely by the human influence on the climate. 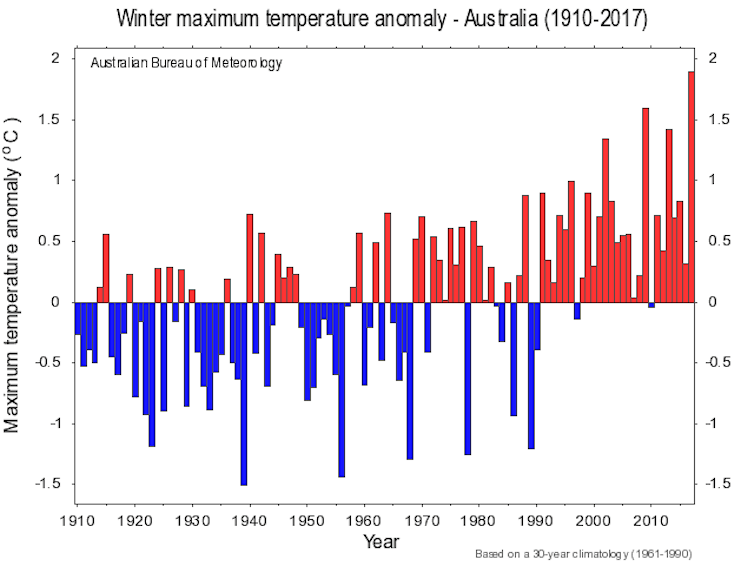 We’re also seeing trends towards less frequent cold conditions in winter, with frosts becoming much rarer over a substantial part of Australia. 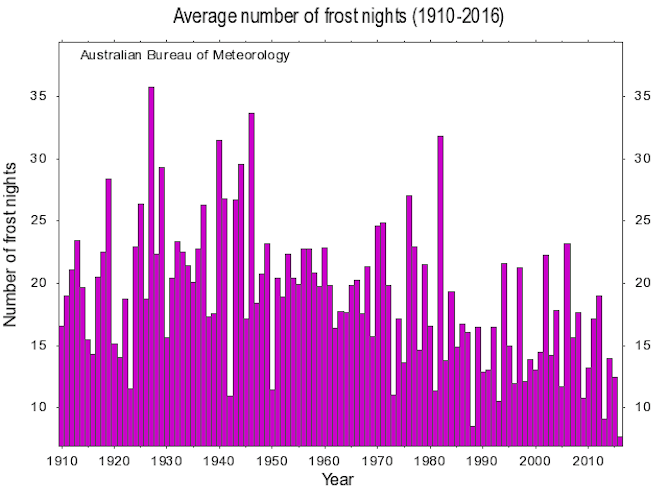 Most of Australia is also experiencing fewer cold days. These trends are in line with what we expect from climate change, and are projected to continue. Australia’s experiencing fewer frosty nights than it used to. While winter warmth can be pleasant for most of us, it can also cause plenty of problems. Warmer and drier winters can worsen drought – an effect we saw during the Millennium Drought in southeast Australia – by increasing evaporation and reducing soil moisture. So while many of us in the south will gladly welcome a warm winter, it’s not good news for everyone. 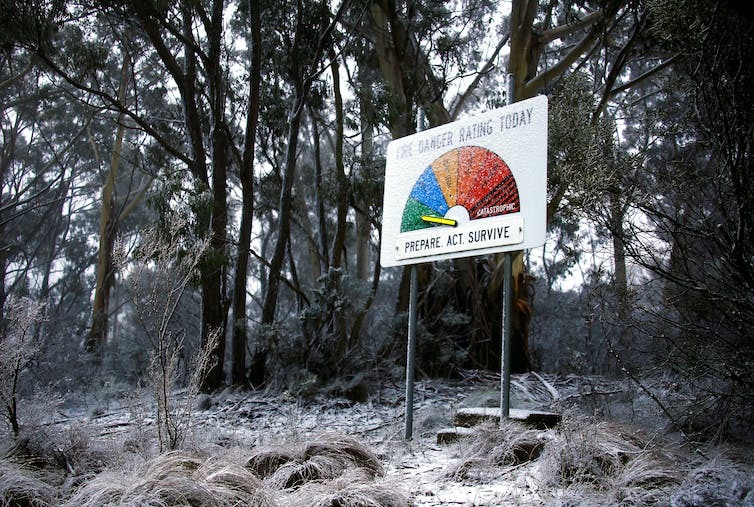 If warm and dry conditions were to persist into spring and summer – which is a distinct possibility with an El Niño watch in place – that would pose even more problems in terms of bushfire prevention, among other hazards.